If you are a startup who hasn’t quite broken into the online world then you are at the right place. 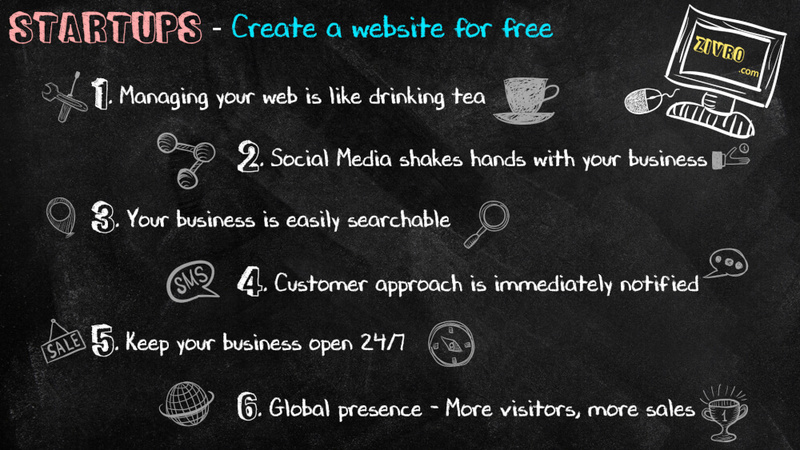 Create websites for free today! Promote your business online using ZIVRO. With ZIVRO, you can create web that evolves with you to handle life time of data. You can update your site yourself. It’s as easy as editing a text document. You can easily write blogs using our built-in blog system to keep your website more attractive and happening. You can drive more people to your site by consistently updating and promoting the contents of your site, because more informative your site is, the greater the possibility of increasing your sales. As a result you can focus on your business peacefully. It’s gonna be convenient for your customers to find out who you are & what you offer. As a result you can worry less about creating awareness of your business. We make sure that the doors of your website is always open. No downtime, No errors and no more technically issues. Your website is in safer hands who take care of your website’s complete technical configurations. As a result you can least bother to have a technical team to maintain your website which saves you a lot of money and time struggling with them. Advertising on your social media profiles like Facebook, Twitter is just a matter of few clicks and inexpensive too. As a result you can save cost on various traditional advertising which serves no use in this digital world. We provide you the tools to help you track everything happening on your website. Starting with number of visitors, no of conversions/ day and everything that gets a smile on your face is what we deliver. You get an instant message through SMS/ Email whenever a visitor is looking forward to contact you. It’s gonna get easier than ever for users to purchase from you. Not just outside your locality, your business is showcased to the entire world, because internet offers a global community. As a result you get more visitors and more visitors leads to more potential sales. That’s how your ZIVRO website will help you.